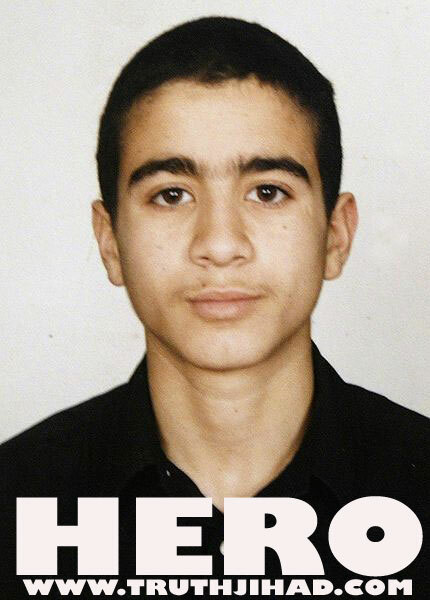 truthjihad.com blog: Omar Khadr, child-soldier hero, returns home! Omar Khadr, the heroic child-soldier who nearly sacrificed his life fighting against the criminal invasion of Afghanistan, is finally returning to his native Canada - but in chains, rather than decked out with the medals he deserves. Normally, a heroic enemy soldier is respected by his adversaries. If that soldier is defending a nation against an illegal war of aggression, his heroism merits even more respect. But rather than giving the fifteen year old lion of the battlefield the applause and adulation he so obviously deserved, the American war criminal authorities decided to lock him up and torture him - indefinitely. And in one of the most ludicrous Orwellian twists in history, the war criminals charged Khadr - a child soldier who fought with extraordinary bravery against one of the worst wars of aggression ever - with being a war criminal! So who is ultimately responsible for this mind-boggling miscarriage of justice? 9/11 was a Zionist propaganda snuff film. And the Zionist-dominated media hasn't let up in its incitement to genocide - its cheerleading for the 9/11-triggered war on Islam for Israel - ever since. A woman named Rosenberg (no relation to Julius and Ethel?) broke the Khadr-is-going-home-to-Canada story for the Miami Herald. Below is my email to her. I read your atrocious article on the tortured and persecuted child-soldier hero Omar Khadr, whose actions - defending a proud independent nation against a criminal Nazi-style invasion - should have won him a medal for service to humanity, not a prison sentence. Your article completely whitewashes the obscene injustice done to Mr. Khadr, to the extent that I believe it leaves you, and your publishers, open to charges of crimes against humanity, incitement to genocide, and complicity in aggressive war (the supreme war crime according to the Nuremburg Tribunal). Weiss estimates that about half of his colleagues and bosses throughout his long career in mainstream journalism have been Jewish and on a mission to defend Israel (by brainwashing non-Jewish Americans and defaming Islam, Muslims, and others who oppose the Zionist genocide of the Palestinians). Since Jews represent only 2% of the population, anything remotely approaching Weiss's estimate would be grotesquely disproportionate, and would scream out for the obvious remedy: Affirmative action to protect goy journalists, especially Arab/Muslim/anti-Zionist journalists, and to reduce the proportion of Jews in journalism to the roughly 2% figure that would be in accordance with US demographics. If you are in fact Jewish, please consider supporting our "Affirmative Action for Goys in Journalism" program by resigning from your job at The Miami Herald so they can hire someone who will report the news objectively - or better yet, an anti-Zionist who can help compensate for the massive pro-Zionist spin that has, until now, dominated the US media. By resigning, you would be showing good faith, which may come in handy when, God willing, you one day find yourself on trial for crimes against humanity.